The comparison of actual and projected job counts in the previous section suggests MEGA has had difficulties in correctly estimating the number of jobs a company might create. In fact, a number of the MEGA board's decisions have even cast doubt on the board's broader judgment of the marketplace. Consider the recent fortunes of Meridian Automotive Systems Inc. Meridian was offered a MEGA deal in September 2004 on the expectation the company would create 250 new jobs at its Fowlerville location in Livingston County. The MEGA business tax credits were worth more than $2.2 million if they were claimed, and the state arranged a Community Development Block Grant of $760,000 and job training subsidies of $125,000, or $500 per worker hired. The city of Fowlerville agreed to match this grant with a 12-year local property tax abatement worth an estimated $7.4 million. MEGA's figures, however, show that Meridian failed to collect on any MEGA tax credits, indicating the company failed to provide even the minimum number of jobs required, let alone the 250 originally projected. Published reports from August 2009 indicate that the company has filed for Chapter 7 bankruptcy liquidation — about two years after it had emerged from its post-MEGA-deal Chapter 11 bankruptcy reorganization. Meridian was able to sell its MEGA-related Fowlerville site to Ventra Greenwich Holdings, which, interestingly, received a July 2009 MEGA deal for the location. Similar examples appear throughout MEGA's history. Webvan.com, an online grocer, was offered $23.4 million in MEGA tax credits in December 1999. In exchange for this potential tax relief, the company pledged to build a distribution warehouse in Michigan and directly create 900 new jobs by 2004. The company's stock never saw a weekly close higher than it was on Dec. 21, 1999, around the time MEGA approved the deal. Documents filed with the U.S. Securities and Exchange Commission show that Webvan officials sold off nearly 2 million shares of their own stock in the company in January 2000. By Dec. 15, 2000, one year after approval of the MEGA deal, the stock was trading at 47 cents per share — a 97 percent decline in value from its high of nearly $20. The company declared bankruptcy in 2001. Another case involved Texaco Energy Conversion Devices Inc. In 2000, the Engler administration issued a press release reading, "MEGA Milestone: 100th Tax Credit Offered to Energy Conversion Devices, Inc." According to the release, Texaco Energy Conversion Devices was supposed to create 82 direct jobs, and the company was offered MEGA's high-tech tax credits, meaning it could receive credits for much lower job counts than standard MEGA recipients. Along with the MEGA credits, the state also arranged for a state education tax abatement, job training subsidies and a local property tax abatement. Ultimately, ECD collected on only 22 new jobs in 2002 and 23 in 2003. The company has not collected on any MEGA tax credits for job creation since. Other MEGA recipients that have subsequently undergone bankruptcy include Kmart Corp, Tower Automotive and Delphi Automotive Systems, the subject of the Engler administration news release cited earlier. One of the most frequent recipients of MEGA contracts is General Motors. Private-sector market analysts have made investment errors similar to these. But these examples do not suggest that the nonmarket or "nonprofit" status of gubernatorial appointees and government staff provides them with special advantages in identifying good companies in which to invest public monies. Jim Donaldson, "Briefing Memo c Meridian Automotive Systems, Inc.," (Michigan Economic Growth Authority, 2004). "All MEGA Projects Spreadsheet," (Michigan Economic Development Corp., 2009). Donaldson, "Briefing Memo — Meridian Automotive Systems, Inc."
 Ryan Beene, "Auto Supplier Meridian to Liquidate Remaining Assets," Crain's Detroit Business, August 10, 2009. Monica Scott, "Republicans Want Proof MEGA Tax Breaks Bring Real Jobs, Such as Hundreds Announced Recently in West Michigan," The Grand Rapids Press, July 23, 2009. 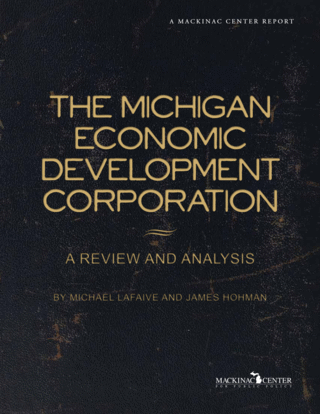 Michael LaFaive, "Failed E-Business Deal Underscores Futility of State Economic Planning," (Mackinac Center for Public Policy, 2001). "Webvan Shuts Down," CNNMoney.com, July 9, 2001. John Truscott, "MEGA Milestone: 100th Tax Credit Offered to Energy Conversion Devices, Inc.," (Office of the Governor, 2000). "Michigan Economic Growth Authority Act." Jim Donaldson, "Briefing Memo — Energy Conversion Devices, Inc.," (Michigan Economic Growth Authority, 2000). Danny Hakim and Leslie Kaufman, "Kmart Files Bankruptcy, Largest Ever for a Retailer," The New York Times, January 23, 2002. "Tower Automotive Files for Chapter 11 Reorganization," (Tower Automotive, 2005), http://www.towerautomotive.com/pdf/pr_20050202.pdf (accessed August 30, 2009). Danny Hakim and Jeremy W. Peters, "Auto Supplier Delphi Files for Bankruptcy, and G.M. Will Share Some of the Fallout," The New York Times, October 9, 2005.